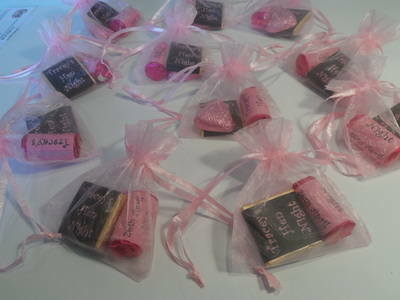 Your own message can be added to the wrappers of the mini square choc and the roll of love hearts. On the mini chocs we can also print a short message, eg: "Thank you for sharing our special day" on the back of the wrapper. Please type in the freetext boxes below the personalisation you would like included on your wrappers. From the pull down menu please choose which flavour you would like for the mini square chocolate bar and in addition please type what colours you would like for your wrappers, the organza bag and the foiled heart.